AMD has always promised that Zen is a core suitable for entry level x86 computers all the way up to high-performance server parts. Within that scale so far, AMD has launched EPYC for servers, Ryzen 7 for high-end desktop and Ryzen 5 for mainstream consumers. All that is left is Threadripper for super-high-end desktops, coming in August, Zen paired with graphics, coming in Q3/Q4, and Ryzen 3 for entry level desktops, being launched today. The two entry level parts are quad core Zen CPUs, targeting the $109 to $129 boundary and offering four full x86 cores for the same price Intel offers two cores with hyperthreading. Designing a core that scales from entry level to graphics to laptops to desktop and up to server is very difficult. You need a design that is very power efficient at the low end of the spectrum, but can push with enough grunt at the very top. When you design a core for each of those specific markets, there are tradeoffs you can make – features for one might not be needed on the other and vice versa. Then add in to the mix thinks like die-size, which will directly affect the cost of the products, and the need to remain price competitive is also an issue. Beyond the core design, there has to be sufficient memory bandwidth and IO for all the processors being made. Having a one-core-fits-all approach is tough. However AMD seems to have pulled it off, going so far as using one silicon die design for everything aside from graphics. The Zen core has shown itself to be a big upswing in performance compared to AMD’s previous generation microarchitecture, and positioned at a price and performance competitive level at almost every stage of its so far. EPYC competes against Skylake-SP Xeons in important benchmarks, Ryzen 7 takes on Intel’s HEDT at half the cost, and Ryzen 5 offers a 3:1 ratio on thread count against the Core i5s at a similar price. So far all the products launched with Zen have aimed at the upper echelons of the PC market, covering mainstream, enthusiasts and enterprise customers – areas with high average selling prices to which a significant number of column inches are written. But the volume segment, key for metrics such as market share, are in the entry level products. So far the AMD Zen core, and the octo-core Zeppelin silicon design, has been battling on the high-end. With Ryzen 3, it comes to play in the budget market. The Ryzen 3 1300X is a cut version of the Ryzen 5 1500X, featuring the same frequencies and the same +200 MHz of XFR, but no simultaneous multithreading and half of the L3 with 8MB of L3 cache. That difference is still worth a third of the price, with the 1500X at $189 MSRP and the 1300X at $129 MSRP. 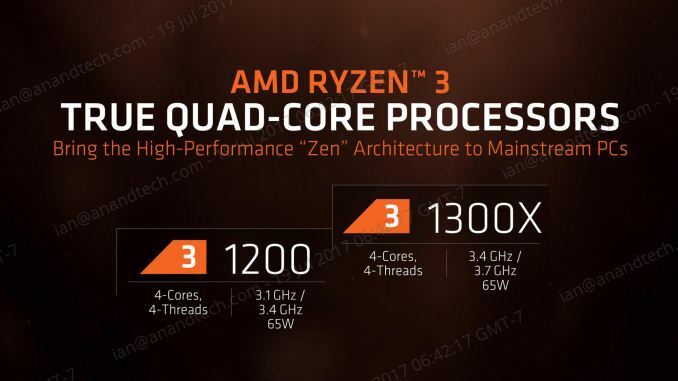 The Ryzen 3 1200 brings up the rear of the stack, being the lowest CPU in the stack, having the lowest frequency at 3.1G base, 3.4G turbo, 3.1G all-core turbo, no hyperthreading and the lowest amount of L3 cache. For the troubles comes the lowest price as well at $109, and should be bundled with the Wraith Stealth cooler (as is the 1300X). Both processors are unlocked, allowing for full overclocking on B350 and X370 motherboards. Given some preliminary numbers for a future review, both CPUs seem to be capable of marching on towards 3.9-4.0 GHz fairly easily. 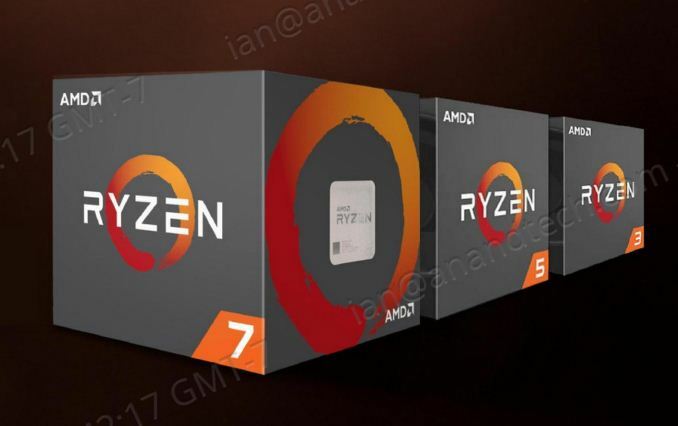 AMD promotes both of the Ryzen 3 CPUs as being part of their 'VR Ready' line, compared with the premium line consisting of the Ryzen 7 parts and all but one of the Ryzen 5s. As mentioned above, AMD is using the same 8-core Zeppelin silicon design as the Ryzen 5 and Ryzen 7 processors, as well as the EPYC server processors and the upcoming Threadripper CPUs. This is done for a few reasons, but namely cost and binning: to design a new set of masks on GlobalFoundries 14nm process is many tens of millions of dollars – if the performance of a unified design is sufficient to meet the targets, then it’s a go. On the binning side, one could argue that these were the processors on the stack that didn’t make the cut for the Ryzen 5 or Ryzen 7 parts, and by selling them cheap (but still reliable), AMD’s effective yield for the process increases and less money is thrown away. In order to facilitate a quad core design from the eight core chip, four cores are disabled. As discussed in previous articles, AMD’s Zeppelin design consists of two core clusters (two CCXs) of four cores each, connected internally via AMD’s Infinity Fabric. Number 3 leads to a lop-sided silicon die, and obviously wasn’t chosen. With Number 1, leaving one CCX, this has positives in making sure that communication between each of the cores was the same, making performance consistency more predictable and less discussion about a non-uniform memory access design within the silicon. The downside is that if the silicon is binned lower because of a potential defect, there only has to be one defect in a CCX to make the whole thing unusable – get one in each CCX and it becomes useless reformed sand. Another downside is thermal performance: having four high performing cores next to each other will put strains on power consumption and heat, and ideally any silicon not in use electrically should be taken advantage of thermally to dissipate heat. There could also be another disadvantage, depending on how much IO is tied to a CCX for communication bandwidth – with only one path through to the DRAM controller, this could limit data flow per core. 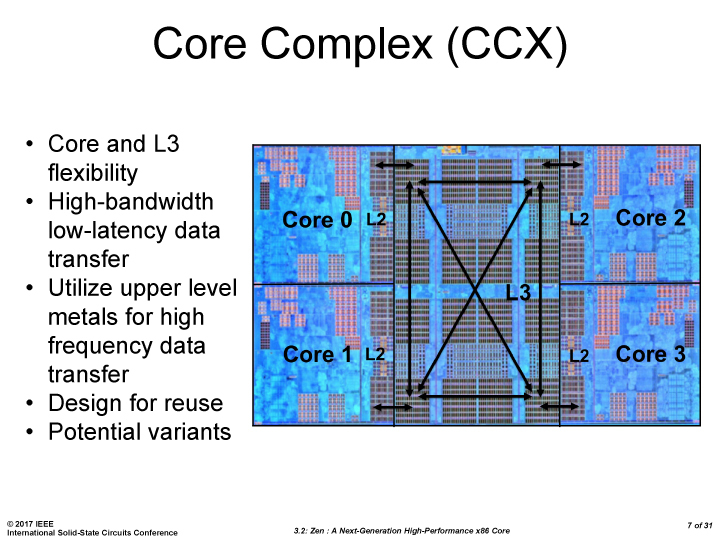 With Number 2, the main advantage is going to be with thermals – with two CCXes in play with some silicon between them, the chip can run cores on opposite ends at a much higher power each without affecting each other as much, leading to potentially higher performance. The downside is core-to-core latency, as the CPU would have extended latency between neighboring cores and those in the different CCX, and it goes back to the non-uniform memory access argument with the Ryzen 7 CPUs. AMD decided to go with the 2+2 arrangement for the quad core Ryzen parts, following on from the 3+3 arrangement on the hex-core Ryzen 5 CPUs. Both Intel and AMD are comparable on platform price, where B250 and B350 motherboards respectively cost around the same. The big upswing for AMD here is going to be overclocking, and potentially push the Ryzen 3 CPUs through to compete with the next one up the stack depending on stock performance. By contrast Intel’s performance is going to be static, and Intel might argue that for entry level products, overclocking is rarely a consideration for the bulk and volume purchasing agreements at this level. Intel also has a slight advantage in having some integrated graphics, negating the need for a discrete GPU. There are two ways to approach analyzing the competition: configuration and price. For configuration, Ryzen 3 are quad-core CPUs without simultaneous multithreading, which would put them up against the Core i5 CPUs, which range from $182 to $239. Comparing on price, the Ryzen 3 1300X at $129 fits between the Core i3-7100 ($109) and Core i3-7300 ($149). The Ryzen 3 1200 at $109 has the Core i3-7100 ($109) at the top end and the G4620 ($99) underneath. Intel would point out that the G4560 at $64 is also in play, and almost half the price. We are in the process of updating our AMD Ryzen 7 and Ryzen 5 results with the new AGESA 1006, and aim to have an article out soon comparing the two. At the time of this review, only the Ryzen 3 1200, Ryzen 3 1300X and Ryzen 5 1500X have been retested, due to time restraints of travel and other projects. In due course, all will be retested and examined. Also due to time, as this review is being published, more benchmark results are coming in. Graphs will be added as this happens.